Yay homemade sauce! So impressive. Italian food is one of my favorite cuisines to eat, mainly because it involves so much pasta and cheese and sauces and general deliciousness. 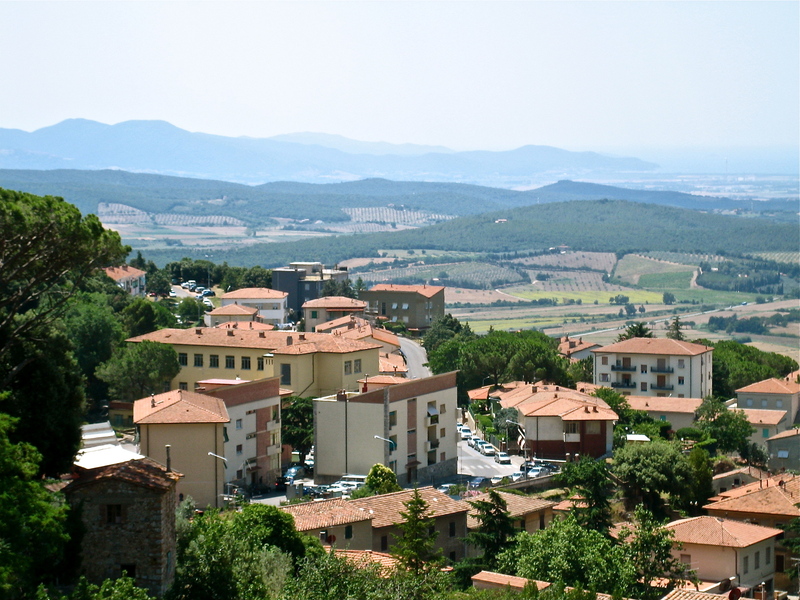 My aunt and uncle have a cottage in Tuscany, and up until a few years ago my cousin also had a small apartment in Siena, which is easily my favorite city in Italy, although admittedly I’m biased by all of my idyllic vacations spent walking around the city eating gelato and drinking Campari soda while sitting on the main piazza. It is pretty hard to find Italian food anywhere in the U.S. that is as simple and fresh as the rustic food you would find in Siena or the villages in Tuscany, but that certainly won’t stop me from eating as much of it as possibly. Sadly, I’m not sure of many restaurants here that serve wild boar stew or black truffle bruschetta (at least for less than about 15 dollars a serving), but luckily there are many widely avaliable recipes for simple meat preparations and sauces. Sidenote: wild boar is seriously delicious, but not the most reassuring thing to hear sniffling around the grape vines after dark when you are sleeping in a garage-turned-bedroom 20 feet away. Vegetable pizza. Slightly non-pizza shaped, don't judge. This is a recipe for a classic tomato marinara sauce from Giada de Laurentiis’ cookbook Everyday Italian. I made this the other day in preparation for making a vegetable lasagna from the same book, which I will post very soon. You need to set aside a bit of time to make this, but other than chopping the vegetables all you have to do is let the sauce reduce for a while as you go about your day (doing more productive things than I tend to on a weekend, I’m sure). I recommend making this whole recipe, which makes 8 cups of sauce, as you can freeze half of it, and it keeps well in the fridge for a week or so. Since this is so simple it is very versatile- you could use it just on pasta, in a lasagna, or as a pizza sauce. It is more chunky than a traditional marinara you might find in a jar, but trust me, this makes it even better. I’ve given recipes for the sauce, as well as a pizza I made recently using the leftovers I had in the fridge. In a large pot, heat the oil over a medium-high flame. Add the onions and garlic and saute until the onions are translucent, about 10 minutes. Add the celery, carrots, and 1/2 teaspoon each of salt and pepper. Saute until all the vegetables are soft, about 10 minutes. 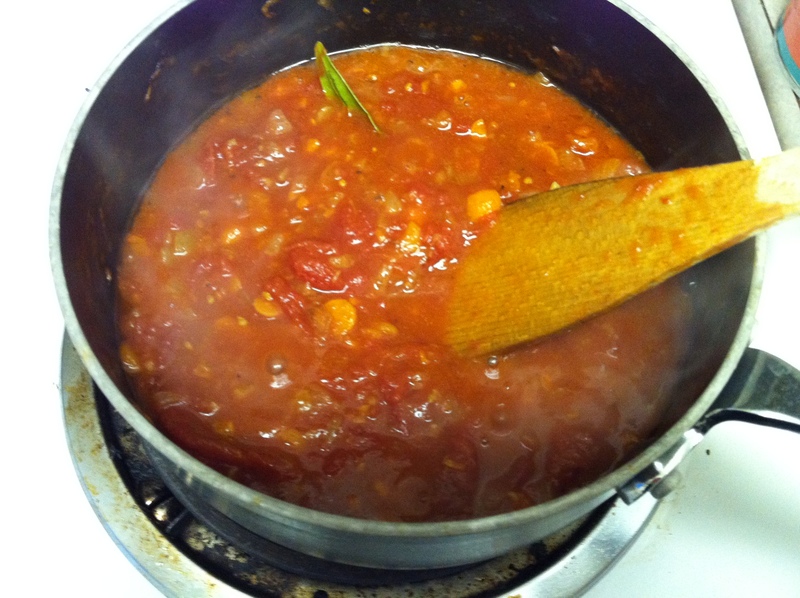 Add the tomatoes and bay leaves, and simmer uncovered over low heat until the sauce thickens, about 1 hour. Remove and discard the bay leaves. Season the sauce with more salt and pepper, to taste. Preheat oven to 450. If the dough has been in the fridge, leave it to rest at room temperature for about 20 minutes. Chop the squash into thin rounds. Then spray the sheet pan with olive oil and stretch/roll the dough into a rectangular shape (it should be pretty thin). 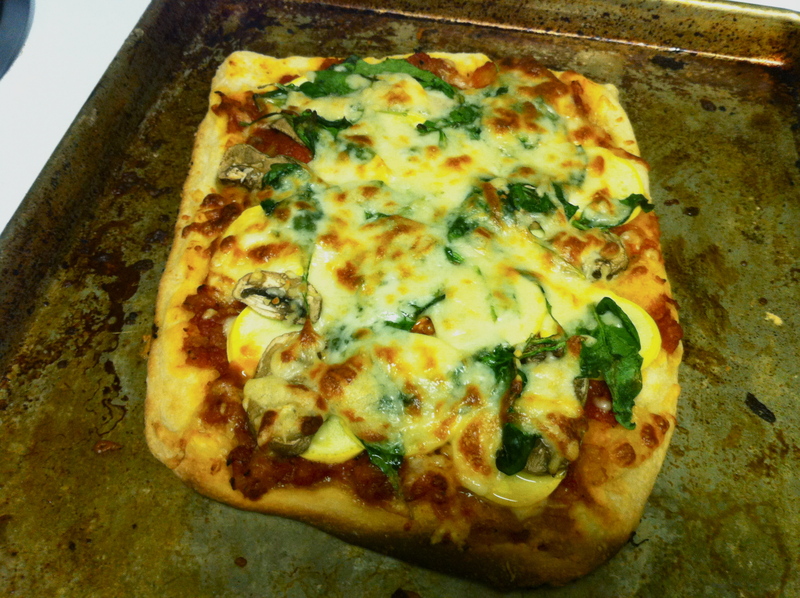 Lay the squash slices on the dough, followed by the mushrooms, and spread the spinach on top. Top with a generous layer of mozzarella cheese, and grate a bit of Parmesan on top of that. Cook at 450 for 10-15 minutes, until cheese is bubbling and crust is brown. Part of the fun of Thanksgiving for us, as the girls have said, is to mix up European stuff with American traditions, which is what we do with the turkey. 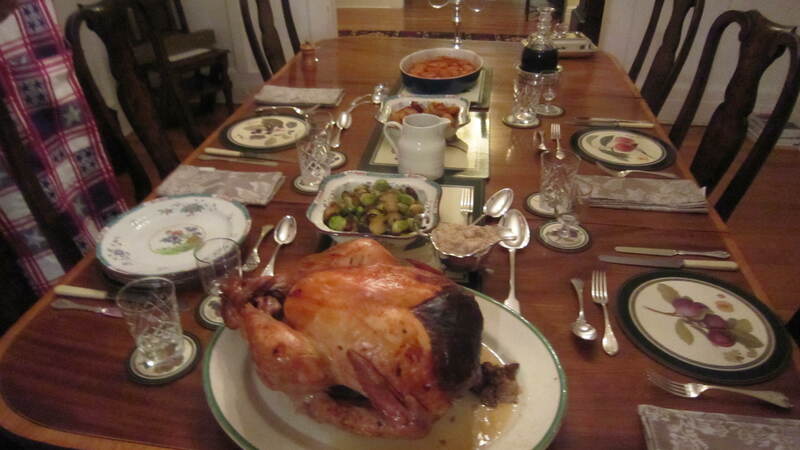 We always cook the turkey (at both Thanksgiving and Christmas) in the French style, which involves… well, you’ll see. The first step is to make a turkey stock, so at noon I sautéed the giblets, neck, liver, the works, in some olive oil, with a whole onion and a couple of small bayleaves. Seasoned, chucked in a few peppercorns, about a liter of water, brought to the boil and simmered. 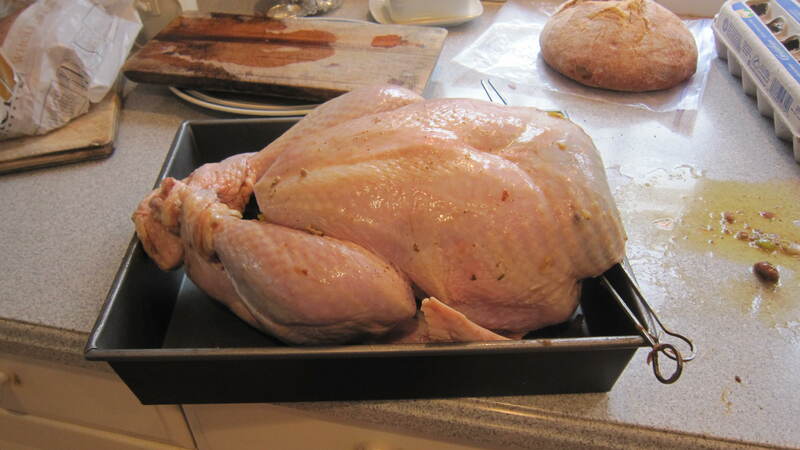 Cleaned the bird and seasoned it inside and out, rubbed the skin with soy sauce and dotted a little butter over it. The nice thing about Thanksgiving is that the rituals remind you of the past. Like, I chopped my herbs for the stuffing in a neat little spice chopper that our friend (and GingerSpice #2 godfather) Mike gave us at Thanksgiving 11 years ago. 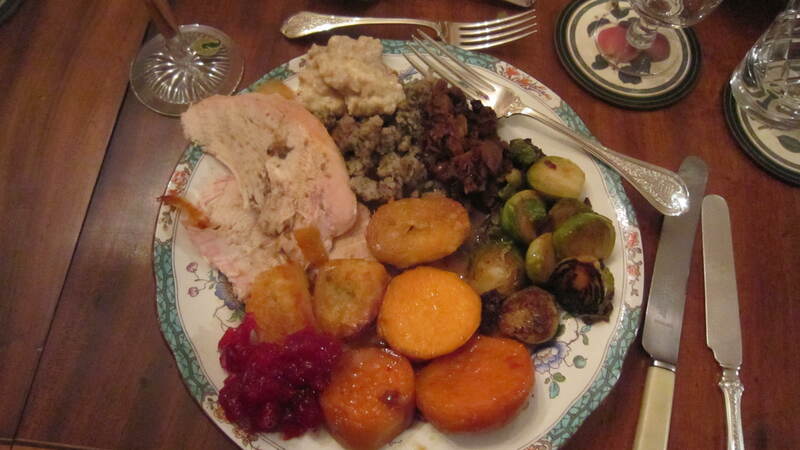 That was the first and only time we ate deep-fried turkey, at a neighbor’s house. Don’t think we’ll repeat that experiment, though I did like having a cigar with the men-folk over the deep fryer, though to be honest I like having a cigar pretty much any time. Anyway, having thought about Mike I thought about my first Thanksgiving, with my friend Marcia (a GingerSpice #2 godmother) in Evanston, Ill., in 1974. So I called her while the stuffing was cooking and she emailed over her recipe (Marcia is an ace baker) for chocolate and pecan pie. When the stuffing was done I stuck it in the big cavity ,then turned the bird upside down and stuffed the other end with the prune and chestnut, knitting everything in place with strategically placed skewers. Then I placed the bird in a deep roasting pan, poured stock around it until it was about an inch deep and covered the whole thing in a tightly-fitting foil tent. 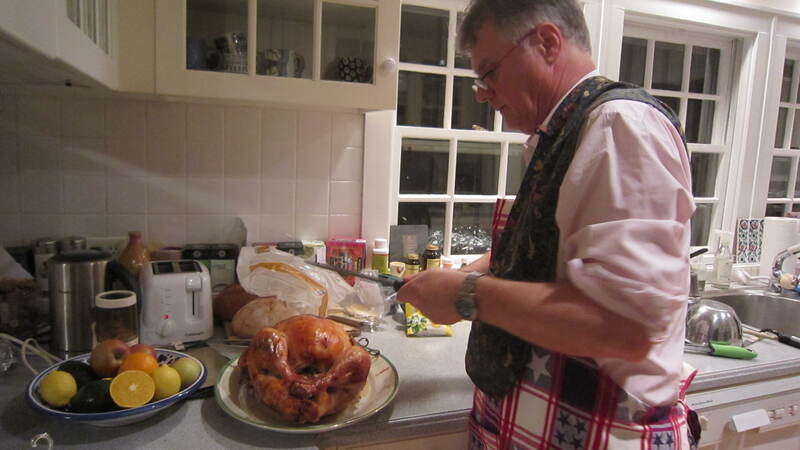 (With this method, you’re really steaming the turkey for three hours, then you take off the tent of foil and let the bird brown for an hour or so.) I’d preheated the oven to 350 degrees, and stuck in the bird at 1.00. 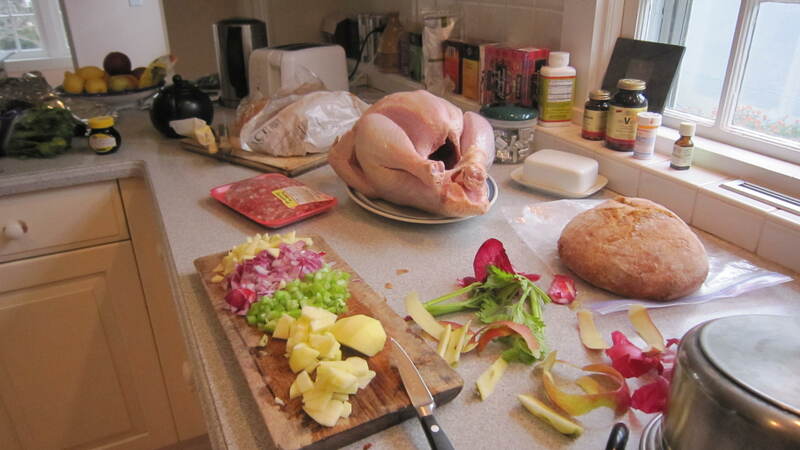 That done, I turned to my other job at Thanksgiving , which is to make bread sauce, a traditional English accompaniment to poultry and game. Now, I’m prepared to concede, this doesn’t sound that exciting. In fact, The Constance Spry Cookery Book, which was first published in 1956 and is something of a Bible in our house, is brutally frank when it comes to bread sauce. “Flavourless, lumpy or unseasoned, it can be unpleasant, and because it is a homely sauce if often carries all these defects.” The sauce should be “neither sloppy not stodgy,” admonishes Constance, while warning that if you don’t get things right “the whole affair can take on the texture of a poultice.” But if you follow my recipe below, you’ll be more than fine – and discover that the creamy sweetness of a good bread sauce is the perfect compliment to tart cranberries as an accompaniment to turkey. ... and one of pie! 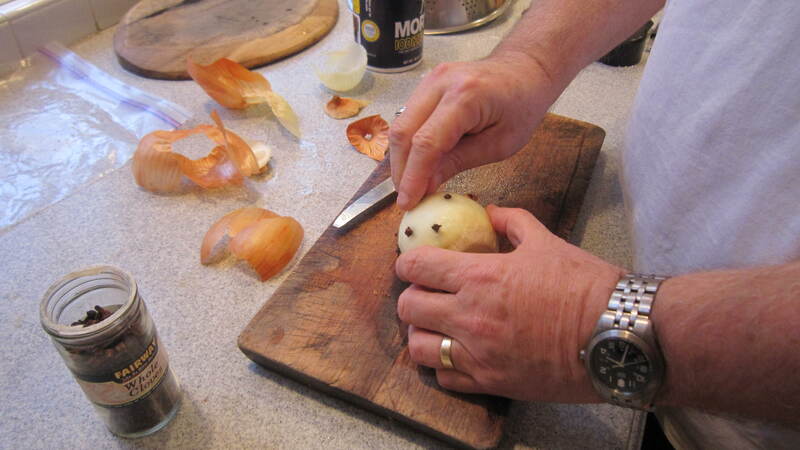 Chop the onion, celery and apple finely. 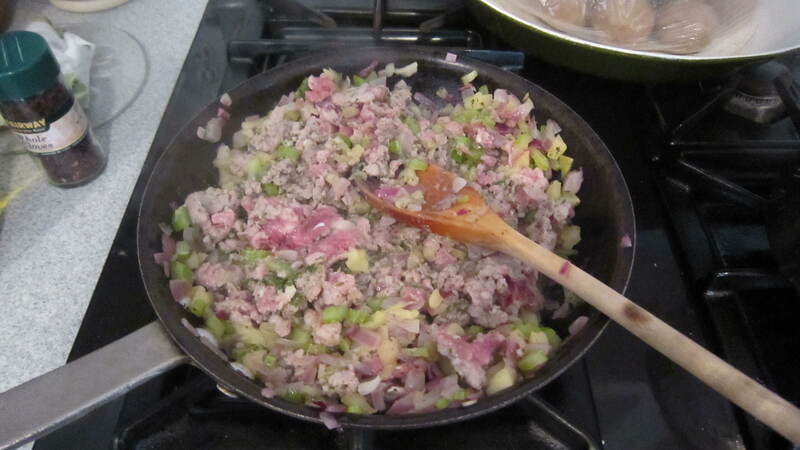 In a heavy frying pan, soften the onion in the olive oil, then add the celery, apple and sausage. Season with salt and pepper. Chop a good handful of sage with a bit of whatever other fresh herbs you have to hand in the garden (I used thyme and marjoram) and stir into the mixture. Cook over a medium heat for about 20 minutes, being careful to ensure that the mixture doesn’t brown. Drain it thoroughly of all fat, leave to cool, and then bind the mixture together with an egg, or two of them if you’ve got them from the farmer’s market and they’re small. Stuff into turkey’s large cavity. Peel the onion and stick it with the cloves. Place the onion and bayleaf in a pan with the milk, bring to a boil, and simmer gently for about 20 minutes. Don’t let it boil over. Turn the bread into breadcrumbs however you want – I use a food-processor. Take the onion and bayleaf out of the milk and stir the breadcrumbs in. Add a decent seasoning of salt and pepper, a knob of butter and a generous pinch of cayenne. Then get your nutmeg – I’m still using a bunch I got from Grenada (whose flag has a nutmeg on it) in 1982, and they’re super nutmeggy. Grate as much of it as you like into the mixture – I like lots – stir and cool. As the sauce cools it will look like wallpaper paste. Don’t panic! When you come to reheat it, add a big dollop of heavy cream, and keep adding it until the mixture starts burping like one of the geyser beds in Yellowstone. Or New Zealand, I suppose, but I’ve never seen those. That’s when you know it’s ready. Serve piping hot with the turkey. 2 ounces (2 squares )unsweetened chocolate)…You can use the supermarket kind or a more fancy pants chocolate… just remember UN sweetened. 1 and 1/2 cups pecans. Marcia uses a cup pecan halves and 1/2 cup coarsely chopped. Mix the sugar and the corn syrup together and boil for two minutes undisturbed.. take off heat. Add the chocolate and butter and stir until they have melted. Let cool slightly..beat the eggs in a medium large bowl….pour the syrup mixture over the eggs slowly, stirring constantly the whole time (you don’t want to cook the eggs). Add the vanilla and pecans and turn the mixture into the prepared pie plate. Bake for 45-50 minutes until the pie is completely puffed across the top, and the crust is browned. Don’t overcook as you want that nice gooey center. 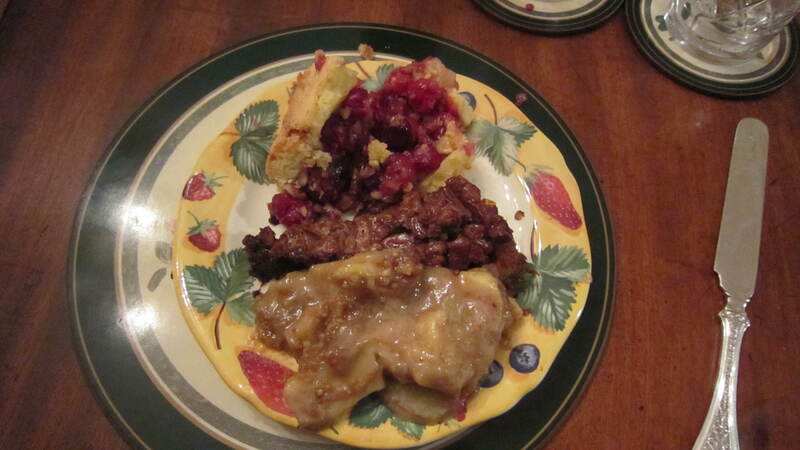 The pie will deflate as it cools..this is OK..serve with whipped cream.